Ecuador’s electoral authorities have invalidated well over half the signatures submitted by YASunidos in bid to prevent drilling for oil in Yasuní, but activists allege fraud under pressure from government. 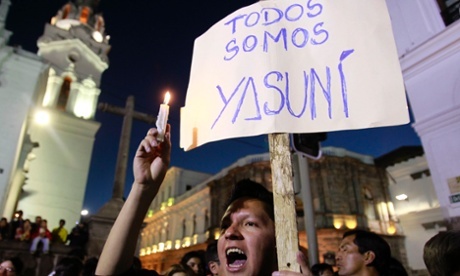 “We are all Yasuní”, reads this placard at a protest against the invalidation of hundreds of thousands of signatures calling for a referendum on the Yasuní oil. Photo courtesy of AP. Efforts to put a halt to the Ecuadorean government’s plans to drill for oil in an extraordinarily biodiverse corner of the Amazon rainforest have been dealt a potentially fatal blow, after the National Electoral Council (CNE) announced that hundreds of thousands of signatures demanding a referendum on the matter were deemed to be invalid. The YASunidos collective, who have campaigned for a public consultation on oil exploration and extraction in Yasuní National Park, had in early April handed over some 756,000 signatures calling for the referendum. However, on Tuesday 6th May authorities at the CNE announced that after several rounds of verification only 359,762 of the signatures had been approved, meaning that the final tally had fallen well short of the threshold for triggering a referendum: 583,000 signatures, equivalent to 5% of the Ecuadorean electorate. Reasons given by the electoral authorities so far for the invalidation of almost 400,000 signatures have included: duplicated signatures or people signing the petition more than once; incomplete forms, such as ones missing valid national identity numbers; signatures apparently signed by non-existent or even fictional people, including characters such as Darth Vader or Batman’s Bruce Wayne; signatures signed by other names not on the official electoral register or by underage citizens; signatures filled out in blue ink, rather than black as specified in the regulations established by the CNE at the start of the campaign; and forms using the wrong type of paper. However, the reaction from YASunidos has been one of dismissal at the verification process, with allegations of fraud, manipulation and bias within the CNE, supposedly an entity separate and independent from the government. Nevertheless, there have been suspicions since the beginning of the campaign that this independence would be compromised, and that the CNE would come under pressure from the government of President Rafael Correa, who in August last year ordered the closure of the Yasuní-ITT Initiative and gave the green light, after approval by the government, to oil exploration and exploitation in the ITT block. The announcement has also provoked a wave of demonstrations and protests by supporters of the YASunidos campaign, both in urban areas such as the capital Quito and in rural, oil-producing areas of the country. In comments published by The Guardian, the YASunidos member Martín Carbonell said “It’s very worrying what has happened. It is the end of the façade of democracy in Ecuador. Since the beginning of the process we have been subject to physical and verbal attacks, so this was not unexpected”. He added that “People are aware that this has damaged democracy. Before this, they had some confidence in government. This was the moment when people could say this is not a democratic government”. Meanwhile, YASunidos have called on the electoral authorities to release the names of the signatures that they rejected, so that those who supposedly signed the petition and had their forms rejected could defend their vote and insist on it being verified. In a response on Twitter, the collective wrote “How can we believe [the CNE] when it says it has found ‘inconsistencies’ in the signatures? With the publication of the names it has rejected”. It also used social media to denounce what it clearly viewed as ‘fraud’. Activists put up symbolic signs on the walls and windows of the Electoral Council, saying “CLOSED”, in protest at alleged bias and fraud in the verification process of the signatures. Photo courtesy of El Universo. Warning signs over the possibility that significant amounts of the signatures submitted by YASunidos would be invalidated, and that the legitimacy and fairness of this process would be called into question by YASunidos and other anti-extraction campaigners, had already been prevalent before the CNE’s latest announcement. Shortly before the CNE announced that YASunidos had ‘failed’ to submit enough valid signatures, the collective had taken the drastic step of withdrawing its team of observers from the verification process, saying that they refused to comply with and give the impression of legitimising a process which they saw as being “completely illegitimate”. During the initial stages of verification, YASunidos members had been denied access to crucial phases of the opening and transfer of the boxes containing the signatures, and they have alleged that it was in these moments that CNE officials may have acted to ‘spoil’ the forms. “They’re sacrificing the will of the 757,000 Ecuadoreans who voted for a referendum, on a formality”, said Pedro Bermeo, a YASunidos activist, after the group’s decision to withdraw its observer teams before the CNE finally revealed it had invalidated the signatures. If President Correa has no fear of going to the polls to settle the Yasuní-ITT question, he continued, “Then let’s have a referendum … and let it be the Ecuadorean people who decides the future of this national park”. A new poll carried out by Perfiles de Opinión for the Ecuadorean daily El Telégrafo revealed that 72% of those surveyed would be in favour of there being a referendum on Yasuní-ITT, with 27% opposed. However, the poll did not ask correspondents whether they would prefer the oil to be extracted or left indefinitely in the ground. Officials from the CNE and the Correa government have, meanwhile, insisted on the validity of the electoral authorities’ decision to reject the majority of the YASunidos signatures. Domingo Paredes, the president of the CNE, commented that the supposed irregularities in the signatures submitted “show a clear intention of deceiving the CNE and the [Ecuadorean] population, to the detriment of the democratic system”. Meanwhile, in comments published in The Guardian, the Ecuadorean Ambassador to the UK, Juan Falconi, maintained that the verification process had been carried out with the collaboration of international observers from the regional Union of South American Nations (UNASUR), and that the CNE had “been commended by regional bodies for overseeing free and fair electoral processes”. YASunidos will now apparently switch to a two-pronged strategy: on the one hand, they will appeal the CNE’s decision and endeavour to have the signatures approved; on the other, they will continue to call for days of action and protest against the government and the CNE, while also taking their case to domestic and international bodies, such as the Ecuadorean Contentious Electoral Tribunal (TCE) and the UN’s Human Rights Council. Meanwhile, the government appears to be pressing ahead, with permits for Blocks 31 and 43 within Yasuní National Park awarded to the state oil company Petroamazonas. The first oil from these new concessions is not expected to start flowing before next year at the earliest, but already local Amazonian communities are expressing fears over their cultural and even physical survival. A recent report in El Universo quoted a local leader saying that communities in the vicinities of the oil concessions had received threats from oil companies because of their resistance and attempted defence of their territories. YASunidos may be planning to appeal the CNE decision and continue to fight for the future of Yasuní-ITT and its population and ecosystems, but time really may be starting to run out. “Long Live Yasuní!” – Activists forming the words within Yasuní National Park, but how much longer will this be the case before oil exploration and extraction is finally allowed in the ITT block?